The difference between key performance indicator (KPI) and Service Level Agreement (SLA) may seem rather straightforward; however, as we will see there is enough difference between the two ensuring you need to know both well enough to ensure the success of your organisation. KPIs are an important metric used in business for determining actions essential to the well-being and success of a organization. KPIs are used to drive attention towards the processes and tasks top management has decided will be most important towards achieving the declared targets and goals. KPIs vary with each organization. An example being, a KPI for a company which is public might be its quarterly profit statement, which will differ from, a KPI for a private company which might be its valuation amongst its fund raising circle. KPIs may also vary for different employees within the same organization. An example, a Chief Executive Officer(CEO) will be more concerned with profit as the most important KPI, whereas a sales manager in the same company might consider revenue as a defining KPI. Due to the nature of KPIs, they are often used to determine targets that are abstract in nature, such as customer experience or query ticket turnaround time. Identifying relevant KPIs is challenging. The determination of KPIs which would be appropriate to the organisation depends, mostly, on organisations ability to measure the metrics. Usually, management will gather necessary tasks and determine correlations and causality between the defined metrics. Although eventually, they must action the relevant KPIs in real-world scenarios and observe the reaction and behavior encouraged by the KPIs. The KPIs having been identified and executed, must be constantly updated with indicators ensuring the metrics re-strengthen one another and do not result in wasteful actions or dilute focus from other priorities. Additionally, apart from being easily quantifiable and clearly measured, all KPIs need to be clearly communicated and well defined to employees in a simple, easy to understand manner. Each employees KPI must be inclusive of the applicable next level of management KPI summary. This ensures all employees are moving towards the same goal. Quite a few organisations limit the scope of KPIs to small tangible sets evaluating the performance of employees within the organization. This is because having several conflicting KPIs can divert the attention of the employee to where the vital metrics are ignored. Establish specific 3-5 KPIs for an employee role or vertical of business. Implement self-automated tools so as to gather and present data to management via a scorecard, performance sheet or dashboard. Examine the progress of the business vertical to determine the performance of the employees within and ensure they are pulling in same direction as the organisation. Frequently, examine the effectiveness of the KPIs. A SLA is a legal document between a provider of any service and its customers, which can be external or internal facing. It is an agreement documenting a specific set of services a provider will offer and outlines the standards of performance, which has to be met as per legal obligations. SLAs enforce expectations from both the provider and customer with regards to the quality and performance across various ways. Uptime and availability – The percentage out of the total time billed when the services would have to be available. Measurable and specific benchmarks linking actual performance with the expected benchmarks to be compared at pre-determined sets of time. Response time – The timelines towards notification to all relevant stakeholders well in time before any changes in network that could affect customers. As there are many different services that can be provided to a customer or organisation. Similarly, an SLA could be specific to availability, performance towards expectations and various parameters for various customers, dependant on their needs. A few examples are server pre-defined uptime, internal networks and components towards infrastructure such as continuous power supply. Additionally, while establishing metrics towards performance, a SLA may also consist of a contingency towards resolution of downtime and proper documentation towards compensation of the customers in case of a breach of contract. Usually, service credits are a common solution. Here, the service provider offers credits to the client on an calculation already specified in the SLA. A service providers can offer credits in accordance to the time it has exceeded the performance guarantee of the SLA. Contrary to this, if a service provider were to exceed the terms of the SLA and go above and beyond the agreement resulting in significant gain for its customers, the SLA can contain payouts and rewards commensurate to the scale and nature of the performance that has been exceeded. An SLA also includes details regarding contingencies. These are situations where an SLA guarantees and helps enforce penalties in case of a breach towards the terms of the agreement. The document may include occurrences varying from acts of terrorism to natural disasters. This is known as a force majeure clause, which is a means to provide relief to the inflicted party from occurrences outside of its control. SLAs have been thought to originate with the information technology boom during the last half-century. Network service providers were the first to implements SLAs but are wide-spread across IT and ITeS fields. Corporate IT companies, with a primary role in IT service management (ITSM), agree to SLAs with other departments in the same organisation. An in-house service provider creates an SLA ensuring the services it provides are quantified, measured and compared with vendors outside of the organisation. Thus, helping the organisation gain maximum value from its resources. An SLA is an important part of any organisation which seeks to manage expectations of their customers and help define the instances failing which they would not be held responsible for downtime or issues related to performance. Additionally, customers can benefit from these agreements as the description of the characteristics of the service, is easily comparably with SLAs of other vendors. The SLA has to be one out of two critical agreements a service provider must insist on with its customers. A master service agreement is set by many service providers to set forth the general conditions of the work. Often, a SLA is used as a simple reference with the service provider’s master service agreement. If one were to compare the agreements for its importance, the SLA is much more important with regard to the services to be provided along with the metrics used towards measurement of their performance. A SLA is usually an agreement that accompanies a service that is being provided over time. This agreement typically outlines specific baseline metrics and expectations that the provider must achieve in order to stay as supplier or vendor. Failure on the terms of the SLA from either side usually incurs in fines or even cancellation of the contract. A KPI is a tangible metric that a organisation has defined as a critical measure of the health and success of their business. Usually, these operational goals are recurring, often working towards a strategic goal (Ex: tracking delivery timelines to improve customer satisfaction). SLAs are often a part of KPIs but the reverse is rare. SLA metrics – Query reaction time, Query resolution time, Compliance to agreed deadlines etc. 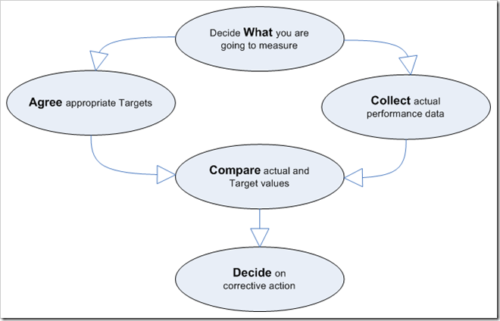 KPI metrics – Average reaction time, Service desk load, Incoming ticket volume, etc. In most accepted cases, SLAs tends to be metrics agreed and recognized across the industry and will pertain to having established ‘best practices’ backing them up. 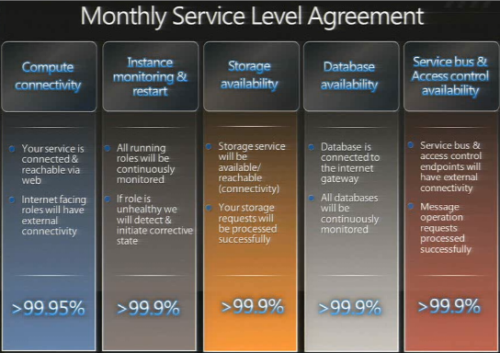 A common example is for SaaS to deliver 99.9% uptime at enterprise level. This is made possible due to the clients insistence and expectation as the minimum baseline for the service. However, KPIs lean towards being pretty specific to each organisation. Sure, there would be some higher level metrics that are common. A common example is business development opportunities as a KPI across different levels of a marketing oriented organisation. Although, typically the KPIs that are important to monitor are unique, or at least not commonplace. Quite often, KPIs are markedly different for employees within the same business vertical. Regular and timely feedback not only plays an important role in tracking KPIs but helps in clearly articulating what the organisation expects from its employees. More often than not, a organisation tracks only 1-2 KPIs to find that other metrics are being ignored which may be more critical to its goals. SLAs are about the necessary and agreed terms of service towards a customer. On the other hand, KPIs are the necessary operational efficiencies and their alignment with the goals of the organization. It is critical to measure both SLA compliance and KPIs in order to drive customer retention and excel quality of service. Anjan. "Difference between key performance indicator (KPI) and Service Level Agreement (SLA)." DifferenceBetween.net. June 7, 2017 < http://www.differencebetween.net/business/difference-between-key-performance-indicator-kpi-and-service-level-agreement-sla/ >.